An order confirmation should be received within 24 hours of purchasing your gift card and will be resent to the sender's email address, not the recipient. This card can be used online or in standalone boutiques only. Read more about the terms and conditions here. Digital Gift Cards are issued by Review Australia PTY Ltd and are redeemable for merchandise only. The balance left on a Digital Gift Card will not be returned to a customer in the form of cash. Digital Gift Cards may not be returned, applied to previously purchased merchandise, or used to buy another gift card. Promotions or discounts cannot be applied to gift card purchases. If a Digital Gift Card is lost, stolen or destroyed, it is at Review Australia’s discretion to replace it if you provide the card number. A replacement card will be the value of the Digital Gift Card at the time Review Australia processes your request. A Digital Gift Card has a 12-month expiration from the date it was purchased, except gift cards purchased in NSW. Giftcards purchased in NSW will expire 3 years from the date it was purchased. 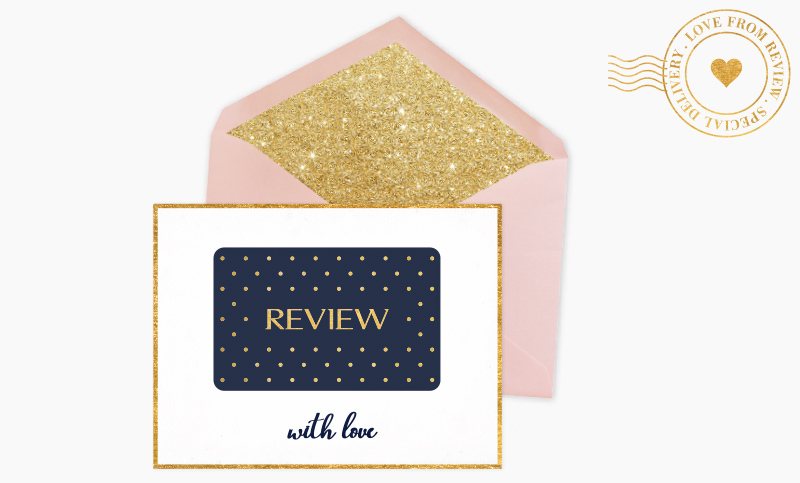 Gift Cards purchased online are not redeemable in any Review boutiques outside of Australia.